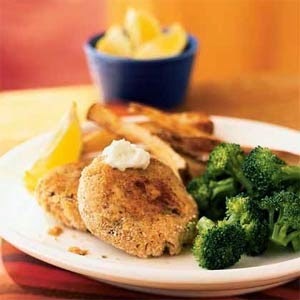 Last week, I made Cajun Salmon Cakes with Lemon-Garlic Aioli, one of my favorite meals! They are filled with flavor and needed only minor tweaking to be Paleo (I subbed almond flour for breadcrumbs in the cakes and skipped the crumb coating). I paired them with a simple cucumber and tomato salad made with fresh veggies from our local CSA farm. And we splurged on our first corn on the cob of the season (technically, corn is a grain that we are supposed to avoid). It was a delicious summer meal! 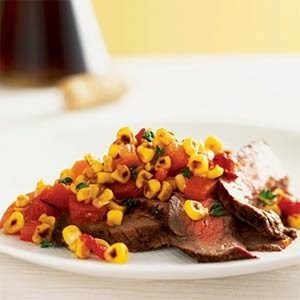 My 20-year old son came home from college on Monday and stayed for dinner, so I made a favorite of his that we hadn't had yet this summer: Adobo Flank Steak with Summer Corn-and-Tomato Relish (yes, we cheated on the corn again! Hey, it's summer). Talk about flavor! Wow, this meal has wonderfully complex flavors - it's a real treat! It takes a little bit of planning ahead because you make the spice rub/marinade the day before and let the flank steak marinate for 24 hours, but it is well worth it. I love anything made with chipotle peppers in adobo sauce, but this one is really special. My son, in his first apartment and cooking for himself now, asked me, "Mom is this easy to make?" Not exactly, but it is well worth the effort. I had trouble finding sherry vinegar the first time (which a few years ago seemed to be the new "it" ingredient) but finally found some at Whole Foods. Another night last week when it was just the three of us again, I made a considerably simpler (but still very tasty) meal we all enjoy: Pan-Seared Tilapia with Citrus Vinaigrette. This goes together super-fast, in about 15 minutes total, but is delicious. I paired it with some sauteed zucchini (plenty of that from the farm this time of year!) and a simple green salad. I was trying to figure out what to do with the dozen or so bell peppers I had from the farm. They are sweet and delicious but tiny, a mix of red and green. 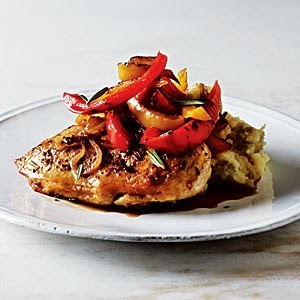 I used my handy Excel spreadsheet for favorite recipes and settled on Roast Chicken with Balsamic Bell Peppers, another recipe that is fairly simple but full of complex, layered flavors. It was just my son and I for dinner that night (though my husband had left-overs after he came home from playing golf), so I went super-simple and skipped a second vegetable. Instead, we had fresh melon from the farm - both watermelon (yellow!) and cantaloupe. Another delicious dinner. Now, the week is almost over, and I still have a bag full of hot peppers from the farm - mostly jalapenos but a few other varieties as well. I plan to make fresh salsa when my son gets home from the beach (I also have lots of tomatoes left!). Any other ideas for cooking with hot peppers? 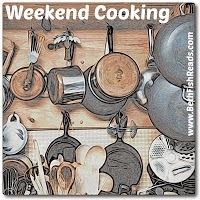 Hope you are enjoying a week filled with good food and cooking fun! The best part of camping - evening campfires! My sons kayaking on Waterbury Reservoir - perfect day! Our beloved pop-up - home away from home! Hope you are having a lovely Labor Day weekend! My Big Book Summer Challenge is helping me tackle some of the books that have been sitting on my to-be-read shelves for far too long! For my third Big Book of the summer, I read Good Fortune by Noni Carter, an emotionally powerful teen/YA novel about a young girl in the early 1800’s, from the time she is stolen from her African home through her slavery in Tennessee and into her young adulthood. The prologue provides a glimpse into the distant memories of 4-year old Ayanna, as her happy childhood in Africa was suddenly and violently disrupted when she and her brother were captured by slave traders and watched their beloved mother die. Then, the novel moves forward to 1821 when Ayanna is now known as Sarah and is a strong 14-year old working in the fields on a plantation in Tennessee. Her adoptive mother, Mary, cares for her like one of her own, and she is very close to her adoptive brother, Daniel, two years older than her, though she still misses her real mother and brother. Mary works hard to convince Missus to give Sarah a place as a house slave, so she won’t have to do the back-breaking work out in the fields under the hot sun anymore. However, Mary and Sarah are both well aware that there are dangers inside the house, too, as Sarah approaches womanhood and begins to attract attention from Masta Jeffrey, the oldest son of the plantation owner. In addition, beatings are still a possibility for house slaves as well as field hands, sometimes for the smallest mistake or misunderstanding. Sarah struggles with cooking and other household chores, but she finds she enjoys her time caring for the younger children of the household. As they attend school and learn to read, Sarah begins to secretly learn with them…but if anyone were to find out, Sarah’s life would be in danger, as it is illegal for a slave to read or write. This powerful, moving novel follows Sarah through her life as a teen and into adulthood. As Masta Jeffrey’s advances become more frightening, she and a few others on the plantation consider escaping to the north, though life for free blacks isn’t the ideal that many imagine it to be. Through all of her adventures, though, Sarah’s greatest passion is not only to learn to read but to get an education and to keep learning. 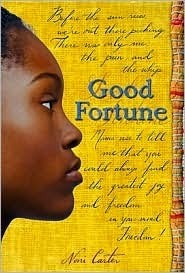 Good Fortune is a gripping, heart-breaking, and heart-warming story about a girl who is driven by a passion to learn. It’s also about her search for her identity, as she struggles with flashes of memory from her early life in Africa, yearning for her birth mother and brother, and being known by different names. At times, it is a difficult story to read, including scenes of slaves being brutally whipped and other life-threatening dangers Sarah encounters. But Sarah’s passion and spirit bring a strong element of hope and optimism to the book. It’s a fast-paced, exciting, and powerful story that I could barely stand to set down. NOTE: Yearning to know more about what really happened to slaves and free blacks during this time period (as most novels about slavery are set closer to Civil War times), I was glad to see that the author included a Fact vs. Fiction section in the back to answer exactly those kinds of questions. No, I didn't mis-type that post title - even though it is the end of August, I am just now summarizing my Books Read in July! We were away most of August, so I am still catching up. 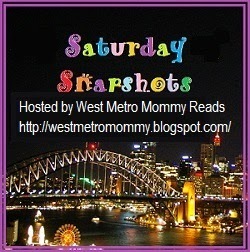 As you can see, despite the lateness of this summary, I am still catching up on reviews! I spent most of the month reading Emma which took longer than I expected to finish. So, I read all fiction in July, but a nice mix with 1 adult, 1 teen/YA, and 1 middle-grade (and two of them audios). 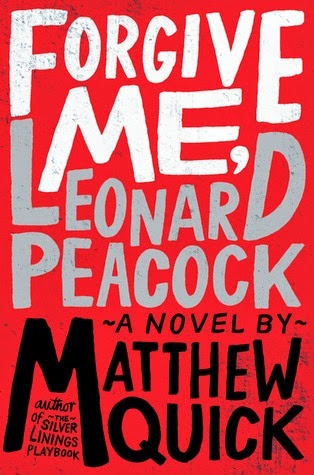 My favorite book of the month was Forgive Me, Leonard Peacock - an amazing, powerful book that should be required reading for all teens and all adults! I still think about it and its main character. I added two new states and one new country to my Where Are You Reading Challenge 2014 this month. I read just 1 book from my TBR shelves for my 2014 TBR Pile Reading Challenge in July, but I feel like it should count for more. Emma had been sitting on my TBR shelves for probably 10 years! I listened to two more audio books for my 2014 Audio Book Challenge, bringing my total to 12, so that one's going well so far. And I finally added one more classic to The Classics Reading Challenge. Emma by Jane Austen was my second Big Book of the Summer, and had the distinction of being one of the books that has sat on my TBR shelf the longest. I bought it perhaps 7 or 8 years ago (maybe even 10?) and never seemed to find the time to read it. While I was reading it last month, I heard from people saying it was their favorite Austen and from others proclaiming it their least favorite. As my first-ever Austen (I know, can you believe it? ), I have nothing else to compare it to. Overall, I found it difficult to get through, especially the first half. I didn’t care much for the story or its main character at first, though both grew on me after a while. For those who have lived in a cave for the past 200 years (and never saw any of the movie adaptations), Emma is about a wealthy young woman in nineteenth-century England who lives in an estate near a country town. She cares for her sickly father and otherwise spends her time gossiping with her neighbors at social functions. Since her mother died when she was young, Emma and her sister were brought up by a young governess who grew into a good friend and has recently left the family to get married and start her own family. Emma is a bit of a busybody, often getting involved in ill-advised matchmaking and then later regretting it and swearing to never do it again. Emma herself says she has never been in love and has no plans to marry, despite her penchant for trying to marry off all her friends. 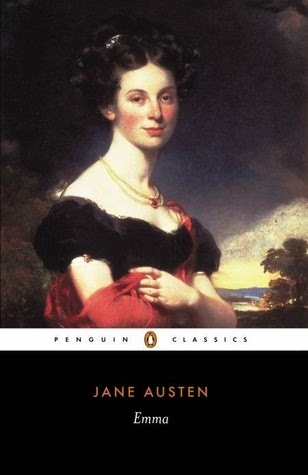 Austen provides plenty of detail on the lives of Emma and her friends and neighbors, and if you like this sort of period drama (fans of Downtown Abbey? ), then this is a great book for you. The characters come alive with Austen’s clever and descriptive writing, and you soon feel as if you know them. Some people told me Emma is Austen’s funniest book – I even recall people telling me it was laugh-out-loud funny. I didn’t find it all that humorous for my taste, though many aspects of the novel are mildly amusing. It is clear that Austen is writing about this high country society with tongue in cheek and gently poking fun at Emma’s sensibilities. Overall, Emma wasn’t really my cup of tea, although both the novel and its namesake character grew on me. I found the second half of the novel far more interesting and had more trouble setting it down. Emma herself starts out as incredibly arrogant and condescending, often making assumptions about people based on their level of wealth and their “place in society.” I know this takes place a long time ago, in a different era, but I still have no patience for that sort of attitude! By the end of the novel, though, Emma does learn and grow, becoming a more likeable character. So, by the end of the novel, I liked it but still didn’t love it. I think that is just a matter of taste; period dramas aren’t my favorite kind of movies, either. I did develop an appreciation for Austen’s writing, and she surprised me with some plot twists I didn’t see coming (though others were obvious). Overall, I am glad to have finally read a Jane Austen novel and to have one less author on my Authors I Can’t Believe I’ve Never Read list. NOTE: One classic novel set in the English countryside in the 1800's that I really did enjoy, more than I expected to, was Middlemarch by George Eliot. I was pleasantly surprised by her clever writing and how relevant her observations of life in 1829 were to the modern world. It's Monday 8/25! What Are You Reading? Things are finally slowing down a bit here and gradually returning to normal (whatever that is!). On Friday, I helped my 20-year old son move into his first apartment, ready to start his Junior year of college tomorrow. My younger son starts his Junior year of high school on Wednesday, and THEN things will really settle down for me. Hopefully, I can begin to get back into some more regular blogging and reviewing habits this week. I am still reading The Goldfinch by Donna Tartt, for an upcoming book discussion the first week of September. I am a little less than halfway and loving it. The story and characters are just so compelling; I'm staying up way too late each night reading! Although my husband and I are still listening to Uncaged, a teen/YA thriller by adult thriller writer John Sandford and co-author Michelle Cook, we didn't have any time alone together last week to listen. This is book one of a new series called The Singular Menace. My husband, Ken, is still reading The Atlantis Gene by A.G. Riddle, book 1 of The Origin Mystery series, on his Kindle. He says it has grown on him, and he's enjoying it. Jamie, 20, was reading The Crown of Stones: Magic-Price by C.L. Schneider when he left home - I have no idea if he's finished it or not. He has been reading like crazy all summer, so the start of classes tomorrow will certainly slow him down. Craig, 16, FINALLY started his summer reading for school! His class was assigned Water for Elephants by Sara Gruen. I kept telling him he'd actually like this school-assigned novel, and he has grudgingly admitted it's not too bad. Not sure if he'll finish by Wednesday! NOTE: This is the last week for the Big Book Summer Challenge, so finish up those big books! Remember to post links to your big book reviews on the challenge page (you can continue to post review links after September 1). Wow, I haven't been home and/or had the time for a Weekend Cooking post since May - gives you some idea of what our summer's been like! We spent two weeks this month on vacation, camping in New Hampshire and Vermont (you can check out some of my NH photos on my Snapshot Saturday post). One of our favorite camping meals is a Foil Dinner. It's very simple but incredibly tasty! You just take some heavy-duty foil, spray it with cooking spray and add ground beef or turkey (or chicken sausage or whatever kind of meat you like) with a bunch of chopped veggies. Season it simply with salt and pepper, maybe a bit of oregano or thyme. Then wrap it up tightly in double foil and place it directly on hot coals in the campfire. We cook it for about 20 minutes, flip it (carefully!) and cook it for another 20 minutes. By then, you can hear it sizzling inside the foil packets, and the smell is mouth-watering. It's just simple ground beef and veggies, but it tastes so good! 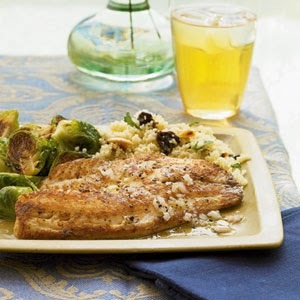 We had that twice while we were camping, and on the way home, I saw a recipe in Redbook Magazine's September issue for a similar dinner that you can make at home. I never thought of doing the same thing on the grill (you can also use a 400 degree oven)! This was a recipe by Carla Hall, of the TV show The Chew, for what she called Campfire-style Shrimp (guess we didn't invent the campfire foil dinner!). In her version, she used shrimp, along with cherry tomatoes, red onions, fresh thyme, and small pieces of corn on the cob. I did something similar this week with shrimp, using the veggies we had on hand from our local farm CSA: cherry tomatoes, bell peppers, red onion, and mini Yukon Gold potatoes. It was delicious! And now I know we can make our favorite camping meal - plus lots of other variations - right at home, anytime. I hope you are enjoying good food this weekend! It's Monday 8/18! What Are You Reading? I have been offline for most of the past three weeks, first on a camping vacation in NH and VT with my husband and sons, which was absolutely lovely - lots of mountains, waterfalls, campfires, and a bit of Ben & Jerry's! (watch for some photos on Snapshot Saturday) Then we unpacked all the camping stuff, repacked beach stuff and spent a weekend in Wildwood at the Jersey shore with extended family, a fun but exhausting couple of days. It was great to see everyone and relive our childhood memories of vacations in Wildwood. 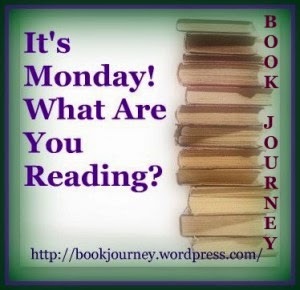 So, now I am trying to get back into my usual routines, starting with a Monday What Are You Reading post. The 600 unread e-mails and dirty laundry can wait. I finished my third Big Book of the Summer, Good Fortune by Noni Carter, a teen/YA novel about a young African girl who is stolen from her homeland and brought to the US into slavery and following her into young adulthood. It was excellent - compelling and eye-opening. I also read my fourth Big Book of the Summer, The Interestings by Meg Wolitzer, a novel I chose for our online family book group. It was a good summer book, starting with a group of friends who meet at summer camp when they are teens and following them through their adult lives. And now I am reading another Big Book, though I may not finish it in time for the challenge. One of my book groups chose The Goldfinch by Donna Tartt for early September. Ironically, this book is even bigger than the books I've been reading all summer for the Big Book Summer Challenge! I also squeezed in a teen/YA graphic novel between the big books: In Real Life by Cory Doctorow and Jen Wang, a great gaming story that addresses some serious real-life issues. My husband and I continued listening to Uncaged, a teen/YA thriller by adult thriller writer John Sandford and co-author Michelle Cook. This is book one of a new series called The Singular Menace. We are enjoying it but didn't have much time alone in the car to listen (our sons don't like listening to audio books anymore). My husband, Ken, finished The Hurt Machine, a Moe Prager mystery by Reed Farrel Coleman, on his Kindle and enjoyed it. Next, Ken read City of Ashes by Cassandra Clare, book 2 of The Mortal Instruments series, one of our son's favorites. He really enjoyed it and wanted to read book 3 right away, but we didn't bring it with us. Instead, Ken chose another book on his Kindle, The Atlantis Gene by A.G. Riddle, book 1 of The Origin Mystery series. He said the science in this science fiction novel is a bit lacking in credibility, but he's trying to go along for the ride and enjoy the story. Jamie, 20, finished 4 long books and is on his fifth! He read A Crucible of Souls by Mitchell Hogan, book 1 of The Sorcery Ascendance Sequence. Next, he read Merlin by Stephen R. Lawhead, book 2 of The Pendragon Cycle, a classic Merlin series we got him started on last year. Switching to another classic character, he read Wolfshead by Craig Charlesworth, a novel about Robin Hood. Next, he read Blood and Iron (The Book of the Black Earth) by Jon Sprunk, a new epic fantasy series that is right up his alley. And, finally, he is now reading The Crown of Stones: Magic-Price by C.L. Schneider, which he was glued to even on the beach with his cousins all around! It's great that he loves reading so much - he's trying to cram in as much as he can before school resumes next week. I'm sure he will make good use of the Amazon gift cards he got for his birthday this weekend! And I gave my teen cousins a bagful of books this weekend, including Endangered. I love sharing great books with friends and family and especially young people! When my oldest son was in middle school, one of his favorite series was Caroline Lawrence’s The Roman Mysteries, featuring four friends in Ancient Rome solving mysteries Hardy Boys/Nancy Drew-style. Now, Lawrence has turned her considerable mystery-writing talents to a new historical realm, the American Old West, with similar exciting results. I recently listened to P.K. 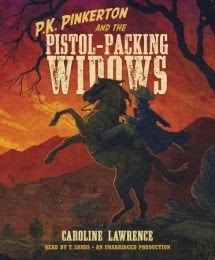 Pinkerton and the Pistol-Packing Widows on audio and met P.K., a 12-year old detective, for the first time (though this is the third book in the series). P.K. is an orphan who lives in Virginia City in the Nevada Territory in the early 1860’s. Kidnapped and taken to Chinatown, P.K. is forced to take on an unusual case, tracking his abductor’s fiancée to Carson City and keeping an eye on him. P.K.’s friend, Jace, is in Carson City and seems to be in danger of falling for a “Black Widow,” whose previous husbands have all died suspicious deaths. The journey itself is wrought with danger. Once in Carson City, P.K. must don many disguises and sneak into the newly formed territorial Legislature in order to keep up with his target and find out what he’s up to. Like any good mystery, the plot twists and turns as P.K. gets into one difficult situation after another, until finally, in order to save his own life, he must give up his most closely guarded secret. The audio book was engaging and well-done, with the narrator using different voices for different characters. P.K.’s voice has a decided Western twang that I got used to pretty quickly. The audio quickly captured my attention and kept me interested. The print and Kindle editions include some fun maps at the beginning to help set the scene. P.S. I started with book 3 and had no trouble catching up, but mystery fans may want to start at the beginning with P.K. Pinkerton and the Deadly Desperados.